What is the Catholic View on Genetic Engineering? You are at:Home»Life Issues & Bioethics»Catholic Bioethics»What is the Catholic View on Genetic Engineering? 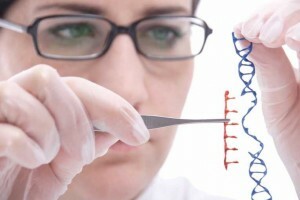 The genetic engineering of humans is not yet a reality. But, with advancements in gene therapy and cloning, it will be and it is critical that Catholics be ahead of the rhetorical curve on this one, instead of behind. Now is the time to look at the genetic engineering of humans and what the Church says on the issue. Now is the time to understand what we as Catholics can embrace and what we should reject. First, under the umbrella of “genetic engineering” we must make a strong distinction between gene therapy and genetic enhancement. These concepts are often confused and lumped together, but there are important moral differences. For many years scientists have envisioned using gene therapy to cure devastating disease. Gene therapy would deliver a copy of a normal gene into the cells of a patient with defective genes to cure or slow the progress of disease. The added gene would produce a protein that is missing or defective in the diseased patient. A good example would be Duchenne Muscular Dystrophy or DMD. DMD is an inherited disorder where a patient cannot make the protein dystrophin which supports muscle tissue. DMD strikes in early childhood and slowly degrades all muscle tissue, including heart muscle. Average life expectancy is only 30 years. Researchers have recently been able to introduce the normal gene for dystrophin in mice with DMD. They achieved this by inserting the dystrophin gene into the DNA of the mice. The genetically modified mice were then able to produce eight times more dystrophin than DMD-mice without the modification. More dystrophin means more muscle which, in this case of a devastating muscle-wasting disease, is good. But apply this technology to a normal man who wants more muscle to improve his athletic ability, and you have entered the world of genetic enhancement. Genetic enhancement would take a otherwise normal individual and genetically modify them to be more than human in intelligence, strength or beauty. It is with this distinction between genetic engineering as therapy and genetic engineering as enhancement that we must approach the advent of this technology. Frum believes that the Catholic Church would find genetic enhancement “laudable” as long as it was available to everyone. Is that true? Is that what the Church is really saying regarding genetic engineering? A strictly therapeutic intervention whose explicit objective is the healing of various maladies such as those stemming from chromosomal defects will, in principle, be considered desirable, provided it is directed to the true promotion of the personal well-being of the individual without doing harm to his integrity or worsening his conditions of life. Such an intervention would indeed fall within the logic of the Christian moral tradition. “In moral evaluation a distinction must be made between strictly <therapeutic> manipulation, which aims to cure illnesses caused by genetic or chromosome anomalies (genetic therapy), from manipulation <altering> the human genetic patrimony. A curative intervention, which is also called “genetic surgery,” “will be considered desirable in principle. provided its purpose is the real promotion of the personal well-being of the individual, without damaging his integrity or worsening his condition of life. Once again this passage clearly states that gene therapy is morally acceptable, but it distinguishes between therapeutic manipulation and manipulation that simply alters the human genome for purposes other than curing genetic disease. Gene therapy is a good, while genetic enhancement is morally troubled. So David Frum is wrong. The Catholic Church would never embrace genetic enhancement even if it was available to everyone. In theory, it is possible to use gene therapy on two levels: somatic cell gene therapy and germ line cell therapy. Somatic cell gene therapy seeks to eliminate or reduce genetic defects on the level of somatic cells, that is, cells other than the reproductive cells, but which make up the tissue and organs of the body. It involves procedures aimed at certain individual cells with effects that are limited to a single person. Germ line cell therapy aims instead at correcting genetic defects present in germ line cells with the purpose of transmitting the therapeutic effects to the offspring of the individual…. Procedures used on somatic cells for strictly therapeutic purposes are in principle morally licit. Such actions seek to restore the normal genetic configuration of the patient or to counter damage caused by genetic anomalies or those related to other pathologies…. The moral evaluation of germ line cell therapy is different. Whatever genetic modifications are effected on the germ cells of a person will be transmitted to any potential offspring. Because the risks connected to any genetic manipulation are considerable and as yet not fully controllable, in the present state of research, it is not morally permissible to act in a way that may cause possible harm to the resulting progeny. Because the effects of a germ line modification, even if it was for a therapeutic reason, could cause unforeseeable and permanent side effects, in the current state of genetic engineering research, a germ-line modification is unethical. In the future, if the technology can prove to be safe and can be done without creating or manipulating human life in a dish, then germ-line gene therapy may be ethical. Many people argue that genetically enhancing a child is no different than getting them the best tutors or making them go to piano lessons. Genetic enhancement, especially a germ-line enhancement is nothing like piano lessons. When a child turns 18, she can stop playing piano if she so chooses. Not so with a genetic enhancement. Genetic enhancement will force her to live with her parents choices for her whole life. If it is a germ-line enhancement, parents will also be forcing their choice on their grandchildren and great grandchildren. Germ-line genetic enhancement of children would be like forcing them and their children, and their grandchildren, into piano lessons for their entire lives. Secondly, because it is important to embrace ethical technology whenever we can. Catholics often knee-jerk against any biotechnology painting it all as unethical. This not only ignorant, but it allows others to label us as uncompassionate Luddites. We must make a distinction between gene therapy and genetic enhancement so we can reap the rewards of genetic research while rejecting the push to fundamentally change humanity. Quite clear, but what about the germ line between say, an elephant and rhino or giraffe and horse orlion etc,these are animals and we eat some….an enhanced taste etc….mamouth and elephant…but cross species looks wrong.. if these are so, what about those tomatoes with a fish gene to make them last longer. Isn’t this also cross species.Food gene manipulation…whats allowable?